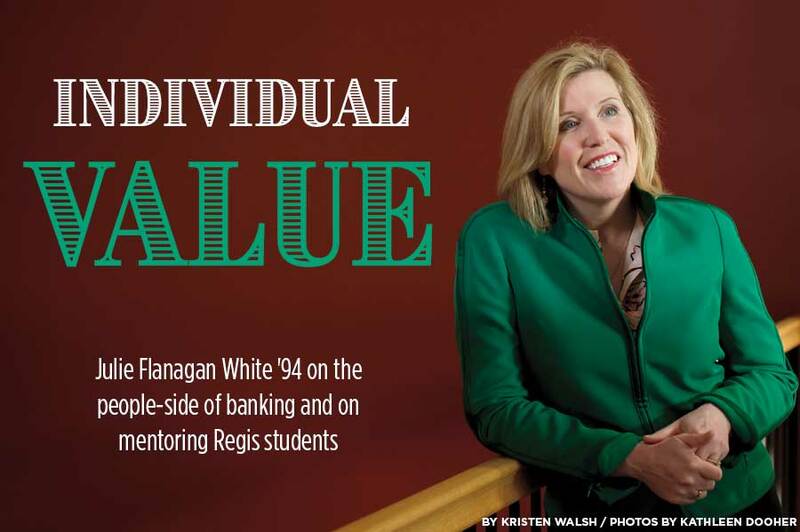 Spend a few minutes with Julie Flanagan White ’94, assistant vice president of private banking at Needham Bank in Needham, Massachusetts, and you may find yourself wanting to open an account. It’s not because she talks numbers; it’s because her favorite part of the job goes beyond that. In addition to servicing existing clients, White’s primary responsibility is developing relationships with new clients, including small business owners in the surrounding communities of the bank’s operations center. Her commitment to relationship-building has merit. A study by Deloitte and Efma (Wealth Management and Private Banking: Connecting with Clients and Reinventing the Value Proposition, 2015) found that in-person interactions—complemented by a multichannel approach to a relationship manager via mobile, online, and telephone “anytime, anywhere”—top the wish list for private banking customers. It’s one reason you may find White taking a quick phone call during her son’s basketball game on a Saturday afternoon or checking emails in the early evening. A commitment to serving people also spills over into the community. Needham Bank is a mutual cooperative bank with a credo of giving back to nearly 300 local organizations a year. White and a colleague, for example, brought their children to a bank-sponsored 5K to benefit local homeless people. This kind of service dates back to White’s days at Regis, when she and Kim Oswiak Beland ’94 would jump into a Volkswagen and head in to Boston to tutor students. “I chose to attend Regis because it was a tight-knit community with a strong mission to empower others,” recalls White, whose mother held that same value of service. And once White got to campus, she became among the empowered. Now it was Caroline Fuentes ’19 and Nolan Bebarta ’20 who were jumping into a car to head off campus on an empowering journey. The pair started the day at a board meeting with White and several other Needham Bank department heads. “Both Nolan and I were able to contribute what we are studying and how it applies to the objectives that were being discussed in the meeting,” says Fuentes, who is a double major in management and psychology. In addition to going over a profit-and-loss statement and balance sheet, White and her team talked about the bank’s 125-year history and its recent growth and change. The “RegisConnect” job shadow program takes place during winter break. Learn more about hosting a job shadow.